The family tree of Jesus traces back to Abraham on his earthly father’s side. How cool is that?! If you know anything about families, you know as well as I do that every family has a relative or two who no one really likes to talk about in public. Abraham almost sacrificed his son with wife Sarah, Isaac. Isaac married two women, siring Jacob who cheated his brother out of his birthright to inherit, and fathered Judah, who slept with his disguised widowed daughter in law Tamar and got her pregnant with twins. Skip 5 generations down to farmer Boaz, son of Salmon and Rahab the prostitute, who married foreigner Ruth, whose son Obed is grandfather to King David, the shepherd musician with several wives. All that soap opera living in only 14 generations! Makes you wonder why Matthew thought to list this lineage, hmm? David’s heir, Solomon, was born to the wife David stole from Uriah, whom he arranged to have killed at war. Solomon was the wisest & wealthiest of the kings, yet had over 900 women in the harem & castle! Solomon’s son Rehoboam had a few good years, as did his son Abijah, but the kingdom split and went downhill under them. Asa & Jehoshaphat, the next two kings followed God but then Joram murdered his brothers to keep his crown, and his son Uzziah wasn’t much better. Next, Jotham followed God, but his son Ahaz did not. Hezekiah was one of two exceptional kings centered out as ‘God first’ men, but between Hezekiah & Josiah were the two most evil of Judah’s kings: Manasseh, & Amon (who was so bad his own servants assassinated him!) His son Josiah (totally sold out to God) fathered Jehoiachin who strayed from God as the last king before exile in Babylon. Up & down, this 14 generations reads like a roller coaster of faith versus evil. Things are more subdued after the exiles return from Babylon, and the kingly blood running through their veins doesn’t seem to keep the next 14 generations from Jeconiah to Joseph from working hard with their hands. Life as a carpenter would not have been easy when times were tough financially, under Roman rule. This lineage reveals how much we all need a Saviour. Because without faith, we all need grace. There was purpose in God’s preparing the way through Joseph’s blood line. No one could say he didn’t come from good stock- kingly blood has always been worthy of respect. The Bible foretold the Saviour would come from David’s line, and so He will. 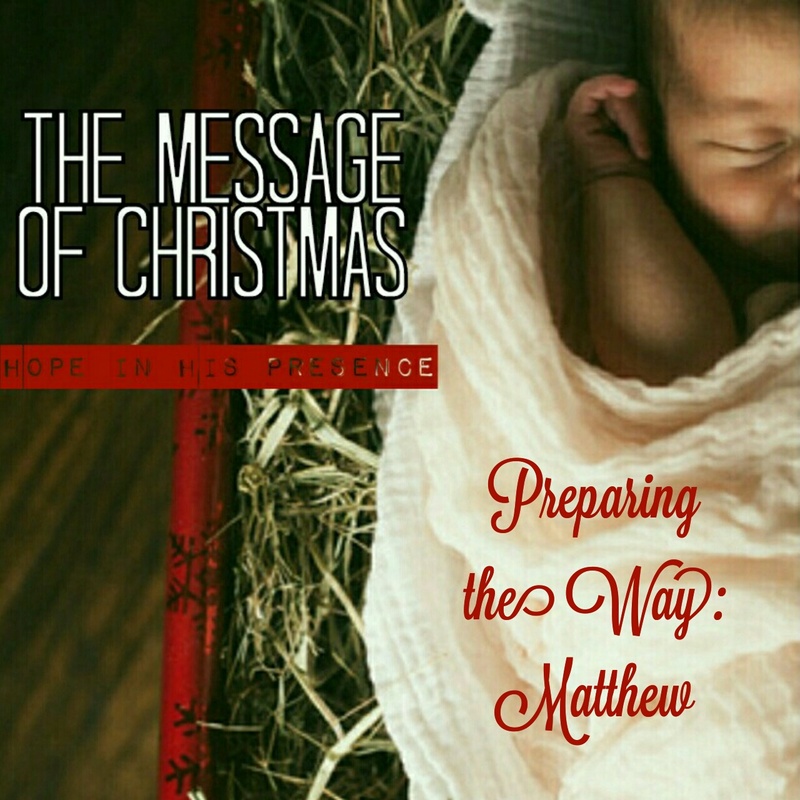 What we see in Matthew 1: 1-17? A God who intimately knows us all, who doesn’t hold the mistakes of those who turn to Him against them, and by naming each generation, shows us every one matters. Even if it needs to take 42 generations to do, God is in control of thus story. As a tax collector, Matthew would have spent a great amount of time crunching numbers and setting value using his scales. The fact Matthew is so detail oriented, specifically mentioning the kings and the women he does on Jesus’ father’s family tree reminds me it is not the outside God is concerned with…but the heart that truly matters. Tomorrow, how does Mark show us how God prepared the way? Thanks for reading it, James! It sure is an interesting lineage! I suppose it shows the heavenly battles that raged as well trying to disrupt the line.